There are actually two variations of Sturmey’s new kick shift hubs, the S2 and the S2C. The S2 is a dual shifter without the break and the S2C includes a coaster brake mechanism. The S2 is not currently available but the S2C is. Gear switching on the S2 and S2C is accomplished by back pedaling slightly. On the coaster brake version, the S2C, a more deliberate and powerful back pedaling will result in the coaster brake being engaged. Below is a video of the S2C Setup in Moulton Bike. It shows the kick back action and coaster braking. I’ve been using a Duomatic for around 4 years now – first a 28 hole one I got off eBay, then a 36 hole I got from Marco. I love them. I would be very interested in a comparison between the Torpedo Duomatic and the new SC2. Can anyone provide one? SO far, the only thing I don’t like about the SC2 is the brake arm. I much prefer the silver of the Torpedo. The SC has been produced before 1966-1970; then it had a steel case and the second gear was direct drive 71-100%; no coasterbrake. See my post at Velobase. Yes, the earlier version called the S2 geared down and is not to be confused with the current version, which gears up. Both are now covered on Sheldon Brown’s gear calculator, http://sheldonbrown.com/gears/index.html. But has anyone taken the new version apart and counted gear teeth to have a gear ratio more accurate than the one to two decimal places given by Sturmey-Archer? Just wondering, for the S2C, backpedalling hard results in a braking effect since it has a coaster brake. What about for the S2? After the kickback gear shift happens, does it continue backpedalling? Yes, it continues to freewheel. You hardly notice any difference between it and a plain single speed freewheel until you begin pedaling forward again. 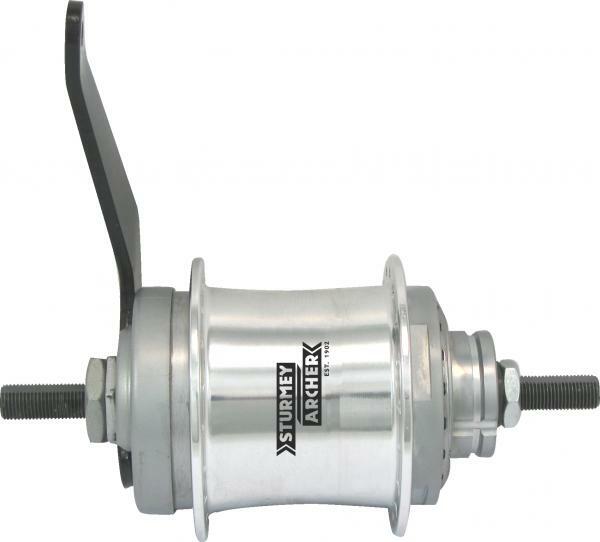 I have the S2 version of this hub (freewheel). In your opinion, what would happen if I only ran one of the lock-washers on the axle? I would leave the DS lock washer in place. 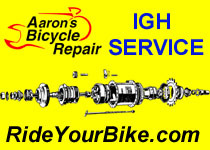 I am asking because I am trying to increase the overall hub dropout dimension from the stock 120mm and removal of this washer on the DS would be a big help. Thanks. I have one of these on my moulton and it leaks, jumps, cracks and annoying to drive because you basically always break when you just want to change the gear. By the way, I realy love the S2C. Two gears, but no maintenance needed at all. Even if the bike is outside all year long in the humid conditions we have here in Holland. The only drawback is that there is no sprocket that suits for a 28 x 1,5 inch size wheel (old fashioned Dutch bikes have comfortable, but rather large wheels)… The largest available sprocket – 24 teeth – is too small to comfortably cycle this wheel size. replaced it with a sram automatix and I am not looking back to that S2C. « Hello Internal Gear Hub Community!